2008-W 1oz Burnished Silver American Eagle Reverse of 2007 MS69 PCGS FS Flag. 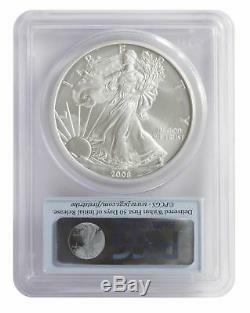 First minted in 1986, the 1oz Silver American Eagle is one of the most widely traded silver bullion coins in the world. The obverse design is based on A. Weinman's "Walking Liberty, " introduced on the 1917 silver half-dollar and features Lady Liberty with Old Glory wrapped around her. The reverse pictures an eagle and shield, displaying American strength and pride. This coin is a must for any collection. Label Type: First Strike Flag. Mint began production of bullion coins celebrating our Nation's foundation in liberty. Available in gold, silver, and platinum, and minted at West Point, San Francisco, or Philadelphia, these coins are accessible to all collectors with a patriotic spirit. Boxes or APO/FPO at this time. This listing is currently undergoing maintenance, we apologise for any inconvenience caused. 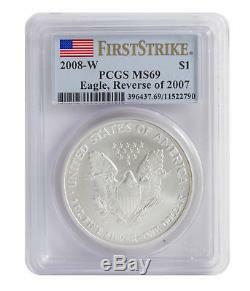 The item "2008-W 1oz Burnished Silver American Eagle Reverse of 2007 MS69 PCGS FS Flag" is in sale since Wednesday, December 5, 2018. This item is in the category "Coins & Paper Money\Bullion\Silver\Coins".